If you were to juice an octopus or squid and turn it into a drinkable cocktail, it might be a faint clear-yellow-orange color, and you might call it Calamari Cooler. 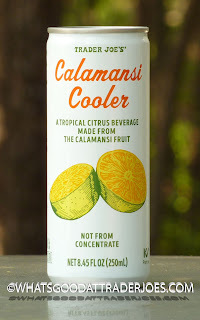 Because of its unfamiliarity, the word "calamansi" didn't exactly roll off our tongues, so we opted to be silly and call this drink "Calamari Cooler." We'd pour a can into a glass and offer our guests some Calamari Cooler and were met universally with surprise and/or disgust. Only then would we explain that we were just being weird because that's just kinda what we do and then we'd show them the can. Neither Sonia nor I nor a single one of our friends had heard of the calamansi fruit before encountering this beverage. We Americans are so sheltered when it comes to exotic fruits. Thank goodness for Trader Joe and his daring ventures into Southeast Asia. It's a strange flavor, especially at first. But it certainly grew on me since my initial reaction. It really does fall very close to a lemon-lime sort of taste, but there's something else there that's very difficult to put my finger on—almost something tangerine-esque. Sonia thinks it might be more like grapefruit. The flavor is light, refreshing, and not very intense at all except for some moderate tartness. Despite the fact that sugar is the second ingredient, it's not overly sweet. It's a nice summer beverage for sure. We'll probably buy it again to beat the summer heat. $2.99 for four cans. Four stars from Sonia. Three and a half from me. Try it with gin and thank me later. We dumped one in a pitcher of iced tea. I grew up drinking calamansi juice so I am so excited to try this. I saw the cans in store yesterday and screamed out of excitement. I'm in love with these. They taste primarily like tangerine or clementine to me with some lemon-lime like you said, and a fairly strong citrus rind flavor like a kumquat. Why did Trader Joe’s stop selling this product?? This nice is delicious. My absolute favorite. So disappointed.